Wash and scrub potatoes clean; dry and cut larger potatoes in half. Place the garlic potatoes and onion in one zip top bag. Place the ranch potatoes into a separate zip top bag. Pour the oil into each of the two bags and zip close. Shake each bag to evenly coat the potatoes and onions in oil. For the garlic potatoes, sprinkle the garlic powder, onion powder, salt and pepper into the zip top bag and shake again to evenly coat. For the ranch potatoes, sprinkle the dry ranch dressing mix into the zip top bag and shake again to evenly coat. Tear off two large pieces of aluminum foil, folding up all four sides to create a “basket” for the potatoes. Pour the potatoes into the foil “baskets”. Place the butter on top of the potatoes and cover with another piece of foil. 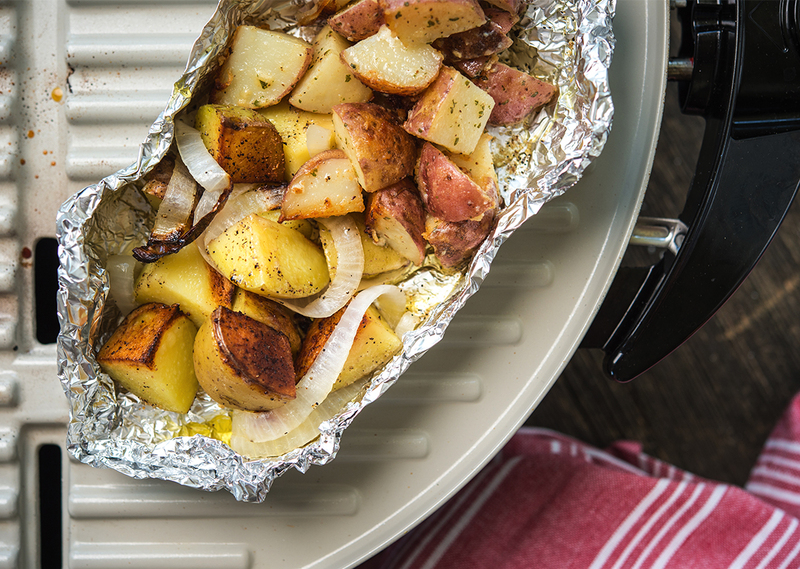 Place the foil packets of potatoes onto the grill. Place the lid on the grill. Grill the potatoes for 30-35 minutes, until the potatoes are fork tender.